Posted on July 27, 2009 at 18:42. 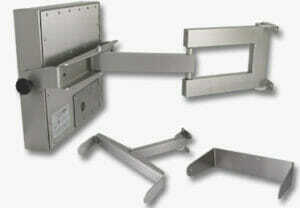 Hope Industrial Systems is pleased to introduce our new full line of heavy industrial arm mounts. Options range from solid wall yoke to fully-articulating arms. Each arm mount is NEMA 4X rated and is constructed of either heavy-gauge brushed 304 stainless steel or black powder-coated steel. All of the wall arms come with our standard 3-year warranty and 30-day total satisfaction guarantee. What’s so great about the new Hope Industrial Systems arm mounts? Our Heavy Industrial Arm Mounts provide an extremely solid workstation platform, ideally suited for harsh industrial environments. These mounts were designed as a rugged, NEMA 4X-rated, industrial-grade solution available for the same price as many office-grade mounts often used in industrial environments. For more details, please visit the new arms’ web page.